Strzeleckie was a Polish geographer, geologist and traveler, a member of the Royal Geographical Society in London. He was born in Western Poland under Prussian rule in 1797. He examined mineralogy and geology in the Appalachian Mountains, Florida and Mexico. He discovered mineral layers and conducted of meteorological measurements and research of soils in Brazil, Uruguay, Chile (Atacama), the Hawaii, Islands, Polynesia, in Australia and New Zealand and Tasmania. In the Snow-Mountains (Australian Alps) Strzelecki detected the highest point of Australia and named it Mount Kosciusko. 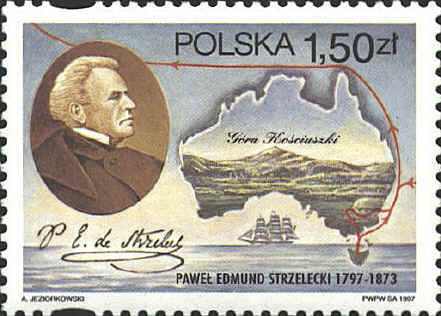 The stamp was issued in 1997 to commemorate Strzelecki’s birth. Mount Kosciusko is pictured on the stamp within the map of Australia.